Cooking is among the surest ways to access ancestral memory. The food we eat tells a story of where we’ve been and where we’re going. Recipes are passed down from generation to generation. They change over time as each generation adds their own interpretation, while remaining true to the original themes like so many stories passed down orally. Despite the fact that most blacks of the Diaspora have never had African food, the legacy of the African past is evident in all of the “soul foods” of the New World. From the inclusion of African ingredients like okra and black eye peas, to the methods of frying in oil, and stewing in rich heavily spiced sauces, Africa lives on in the soul cuisines of the American south, Latin America, Brazil, and the Caribbean. It is perhaps no coincidence that our food is called “soul food.” For the foundations of Diaposoran soul food lay in the harsh crucibles of slavery, segregation, and material deprivation that have characterized black life in the New World. It was precisely the ability to “make something out of nothing” combined with deep spirituality and faith in God that allowed African descended people to survive in their new homelands. Imani (faith) is the last principle of Kwanzaa and it happens to fall on New Year’s Day, a day already imbued with spiritual significance for African Americans. African American churches hold “Watch Night” services on New Year’s Eve and black households can be found serving black eyed peas and greens (usually collards) on New Year’s Day. The black eyed pea is eaten for good luck and greens are eaten for financial prosperity in the year to come. These traditions pre-date Kwanzaa as cultural markers for African Americans and I have taken to combining them with a traditional African dish as our family’s New Year’s Day meal. 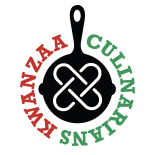 I enjoy combining foods from around the Diaspora to showcase the continuity of African food ways and to celebrate the ingenuity of African peoples to incorporate European and Native American elements into creolized soul cuisines. This year, I plan to make my favorite Senegalese dish Chicken Mafe, a peanut stew prevalent throughout much of West Africa. When I lived in Fort Greene, Brooklyn in the late 1990’s, Mafe was my favorite dish at a Senegalese restaurant on Fulton Street owned by Chef Pierre Thiam. Chef Thiam now owns Le Grand Dakar Restaurant in Brooklyn. 1. In a large pot, heat oil under medium-high heat and brown chicken pieces on all sides. Remove chicken and set aside. 2. In the same pot, add the onion and sauté until translucent. 3. Add bell pepper, carrots, cabbage and potato and stir approximately 5 – 10 minutes. 4. Add garlic and stir for 1 minute. 5. Stir in peanut butter and tomato paste. Add chicken stock or water as needed to mix and reach desired consistency. 6. Reduce heat to medium. Add remaining ingredients except fish sauce and chicken and stir approximately 5 minutes. 7. Add chicken, cover and stew 30 minutes to 1 hour until chicken is done and vegetables are cooked through. 8. Add fish sauce and stir approximately 1 minute. 9. Serve with rice or couscous. *Note: Based on a recipe of Chef Pierre Thiam, owner of Le Grand Dakar Restaurant in Brooklyn, NY. When I lived in Fort Greene in the late 1990’s, Chef Thiam owned a restaurant in the neighborhood called Keur N’Daye. This was my favorite dish! Steven Allwood is a doctoral candidate in clinical psychology and a passionate foodie. He lives in Atlanta, GA with his wife and two daughters. Steven blogs at SteveAllwood.blogspot.com. Having grown up in Ohio, and my mother was from Philly, she always cooked blackeyed peas for New Years Day but I don’t remember her giving the history behind it. She just said that’s what they did in Philly. She also made a sauerkraut salad to go with the peas. Not sure where she got that from, but we lived in a small town with German ancestry, so that might explain it, but that was one, delicious meal! The Peanut Stew looks and sounds absolutely delicious! I must try it with tofu. As a vegetarian, what can I substitute the fish sauce with? Hey, Wanda! Try substituting fish sauce for soy sauce. Thanks for visiting! a pressure cooker recipe! yes, I’m for it. I love how you brought some of Brooklyn with you down to Atlanta where the food is Southern and diners are very loyal to it. And, so wonderful to see the kiddo’s learning about their heritage at such an early age. Thanks for the recipe. Have never had mafe before. In fact, don’t think I’ve ever had anything from Senegal! This entry was posted on December 31, 2011 by Bren Herrera in 2011, Imani, Personal Story, Recipe and tagged chicken, Chicken Mafe, Imani, lamb, Peanut Soup, Senegalese, SteveAllwood.blogspot.com, Steven Allwood, stew.